Chilly , Fall is Here…..
Tues. Sept. 22, 2015 – Yesterday was so fall like, added an extra layer in the morning…..enjoying the heck out of some new SIMMS stuff….the Fall run jacket is incredible. Felt really good this morning too, it was in the upper 50s when we put in and breezy. A cool day, and with the ridges around the river showing color, I’d say for the most part that fall has arrived. 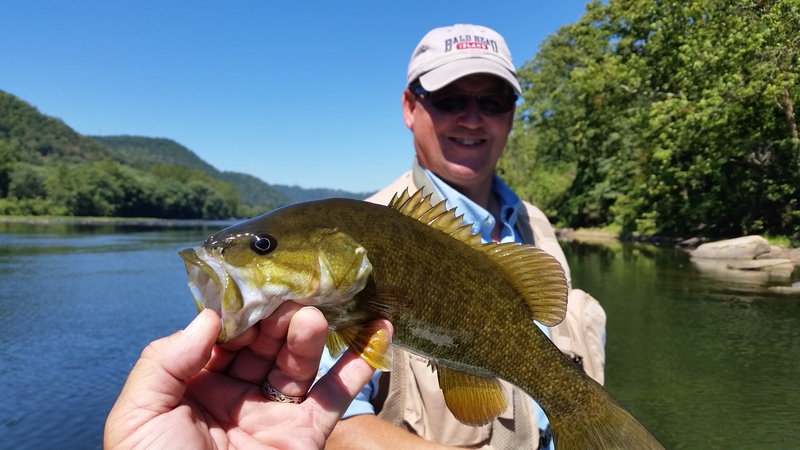 On Tuesday I did a float trip with Gloria & Ken Okorn, Mechanicsburg, PA, a New R Va Smallmouth float, Ken is also a guide in PA and has become one of my best clients and friends. His knowledge is vast….I learn much from him when I get to spend some time with him. We put in early and floated a 7 mile (approx) stretch of river and while it was slow to get going we caught a few early, one here, one there, just enough to keep it interesting. Gloria nailed a good fish just above the first major set of rapids, in the tailout where smallmouths so often love to hold. We fished through, saw a huge musky and took a few shots at him but he didn’t stick around after showing a slight bit of interest. Gone. I have seen that fish (reasonably sure its the same fish) for months now when occasionally float this longer stretch of water. A rematch vs him will occur I assure you. We fished our way downriver, caught a nice fish or too on a popper, then moved past some more rapids where I thought we’d do well. It was chilly, windy (temps in high 50s to start, struggling to make 60 by afternoon, a real change) and it wasn’t till half way through the float where things started to pick up. We did well in one spot, a deep ledge/channel and nailed many fish there. We went from 10 fish or so to about three dozen in short order. Our last stretch was good, we caught maybe fifteen more and several the best fish of the day, and lost a couple of really nice fish that came off just before reaching the boat. We didn’t catch any pigs today, but several up to 14″ or so and maybe between 40 and 50 total I guess so a good day. Always a pleasure to spend the day with Gloria and Ken. Have a busy weeks end with several guided trips, and then next week we will be making ready for a busy fall schedule as our local NC waters/delayed harvest waters will be stocked for the first time. 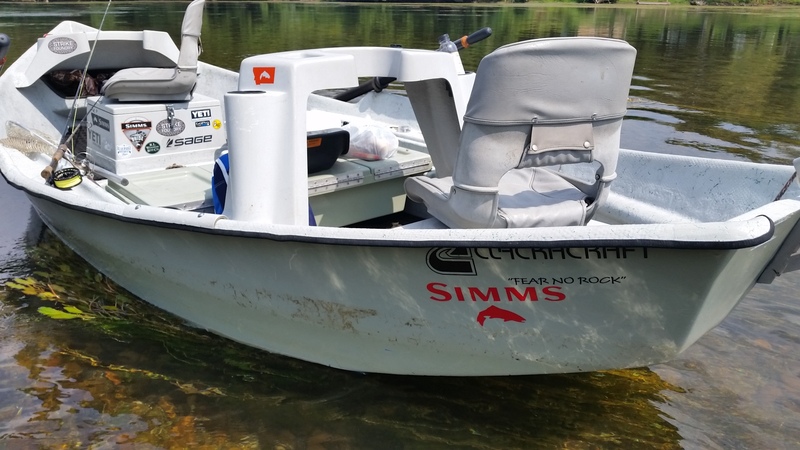 Many have voiced the concern that low water might present a problem for stocking but if that is the case we’ll be right in the know on it and will be fishing regardless. Its cooled off a lot, and we have had some rain and are expecting more in the coming days so all looks good. Here’s one of our past clips re- living September ……such a great time to target these brown bass…….they are incredible and I love them as much as my brown trout…. Have a great one…..good fishing…! Mon. Sept. 21, 2015 – We had a string of some of the most gorgeous days that we’ve had all year. Fortunately, I was able to be out on the water with clients getting into some great fishing. 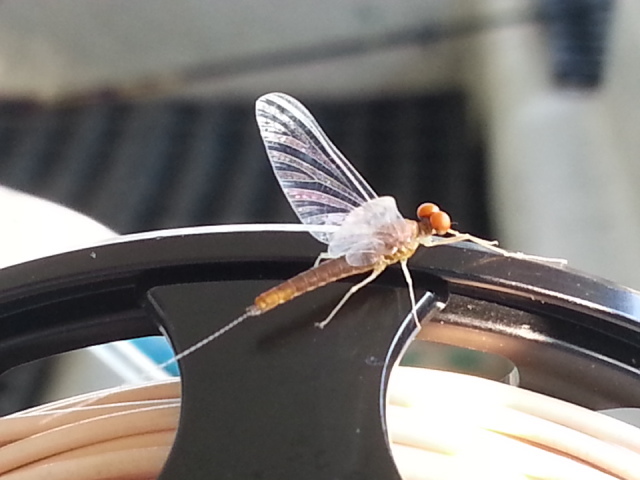 Small fly season is upon us, and I would especially second that if you are fishing tailwaters…..better have lots of midges, blue winged olives ……that fishing is here. I was out this past Saturday with a good client whom I get out with a lot, Dr Ken Karb. Ken and his two sons, Dan and Ben, and two of their friends Kevin and John met us on the river and we enjoyed a great day on the South Holston. We got a really early start with the expectation of it being a Saturday and nice weather and great fishing maybe there would be a few people to contend with. My plan was to be there first where I knew we would have a shot at good fishing and we were there first. And we were able to fish a long stretch of water and have it pretty much all to ourselves. We got in and there were rising fish pretty much from the time we started. Our release schedule would be a one hour pulse midday with generation coming midafternoon. Our plan was to fish til rising water and call it a day. We caught fish early on terrestrials and new midge patterns of various kinds (top secret), and we also caught a good many fish on dries. Sept is transition time on the SoHo, and with flows, temps, recent warm weather we are still in that. What does that mean? Sulphurs, good some days , spotty others, a few blue wings here and there, midges galore, and still the occasional fish eating a terrestrial here and there. Lots of fish, lots of sight fishing opportunities….we did really well. Ken and his son Ben were tops with over 20-25 fish landed each, everybody caught double digits, so I’d say we had a really good day. I’d say 75 plus but just a rough guess. In any terms, very good. We caught a lot of fish on new patterns (always working on those….I always keep a few in the background, stuff I don’t sell and ones that have to work when it gets tough). We caught fish on pretty much everything. Until we get some chilly weather this will be the Soho song for a while. But cooler temps definitely have fish moving. Big fish……saw several double digit fish cruising (double digit meaning 10lbs or more)those are in a prespawn movement pattern, they will spawn come late Nov to Dec depending on weather ……super spooky , you aren’t going to nail one of those on a bright sunny bluebird day on low water like we had……need a nasty, yucky day to do that. In any case though, we had an outstanding day. Busy week coming up with several trips, both wade and float, and cooler temps and some rain should only make good better. The cooler weather has definitely brought out some flies, notably blue winged olives….a normal fall thing, Caddis will follow on some waters, lots of them, and also craneflies. The terrestrial bite will get one last hurrah before its over too, lasting well into and past our first frosts. So these are good flies to have. 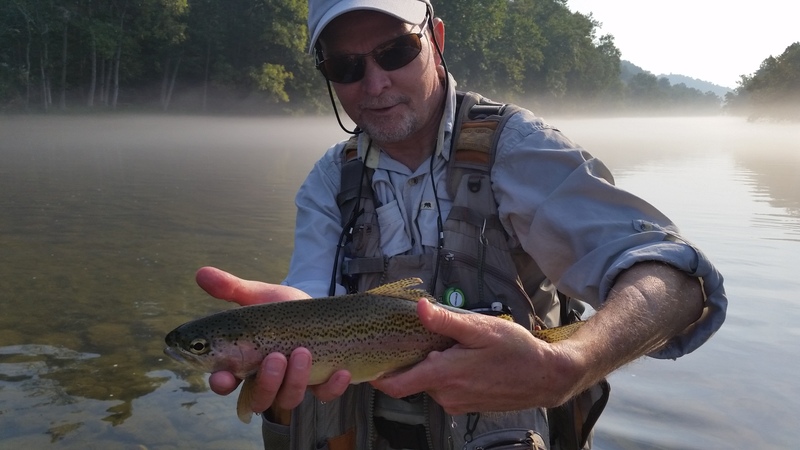 Sulphurs, while still hanging on a little day to day on some of the TN tailwaters, like the SoHo and the Clinch, will be going away soon as well…..at least in the sense of there being any ‘hatch’ in comparison to the magnitude of what occurs in summer months. 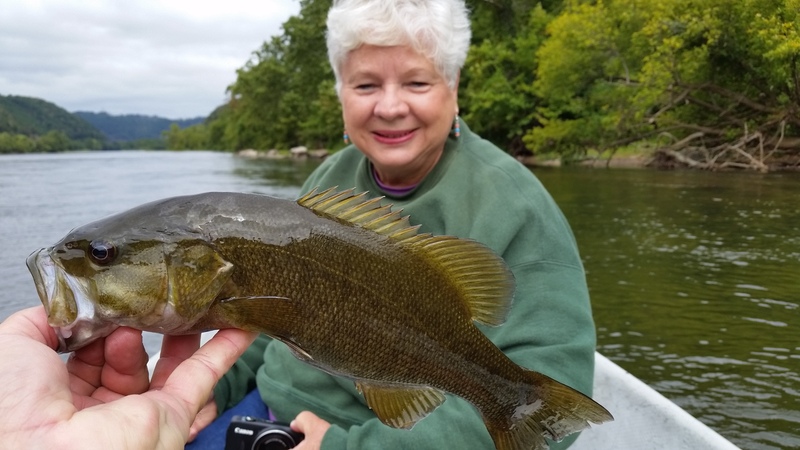 Tommorrow we’ll be doing a float trip with Ken and Gloria Okorn , Mechanicsburg, PA, and we will be floating the New River in Virginia and doing some smallmouth and musky fishing. Should be a great day……rain, gray, and wet. Perfect if you ask me. Thurs. Sept. 17, 2015 – Feels great outside, what glorious weather we’ve been having. 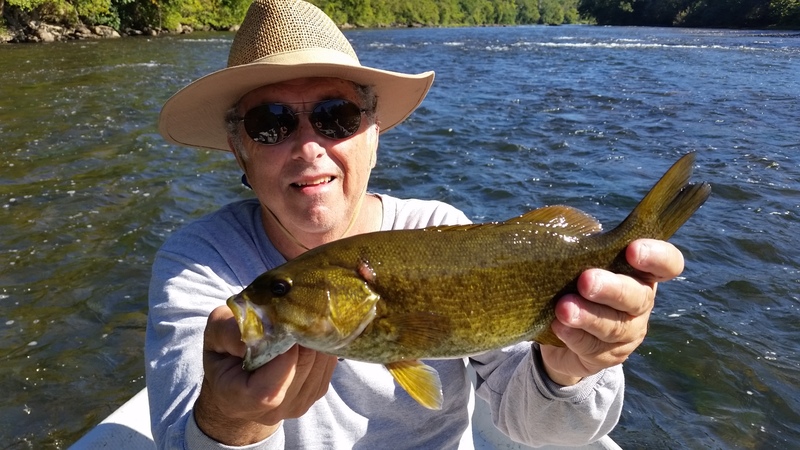 A busy week, did another trip yesterday with Larry Tomar, Frank Kincaid, Greensboro, NC, New R smallmouth float trip, we did a 7 mile all day float morning til dark……did ok and caught fish on both flies and light tackle. The Shenk’s Minnow patterns I’ve been using have worked well and continue to do so, we caught a few on crayfish patterns too. First half of the float we had numerous sight fishing opportunities, and caught some pretty good ones and saw some too, along with several huge musky….we didn’t fish for muskies but will be soon as the cooler fall temps have them definitely on the move. We saw probably 4 or 5 of them in the upper half of our float. We fished topwater too and caught a few fish that way as well, particularly late in the day. 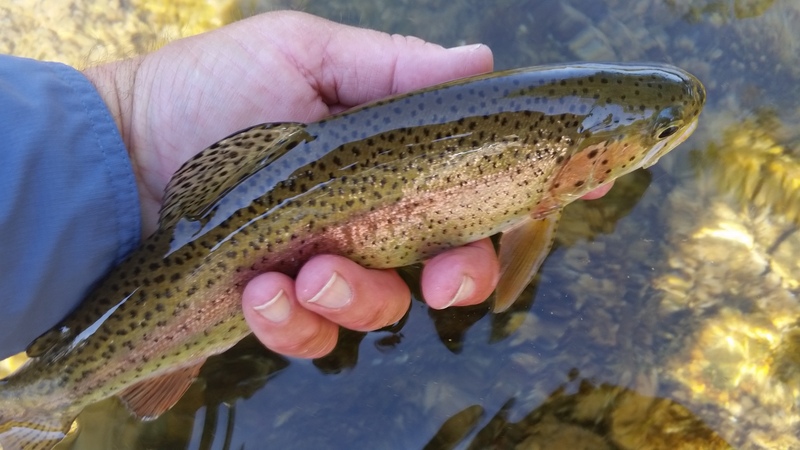 Flows are really low and the water is ultra clear, about as clear as you will ever see on the New R…….with no significant rain in the forecast that is likely to continue. 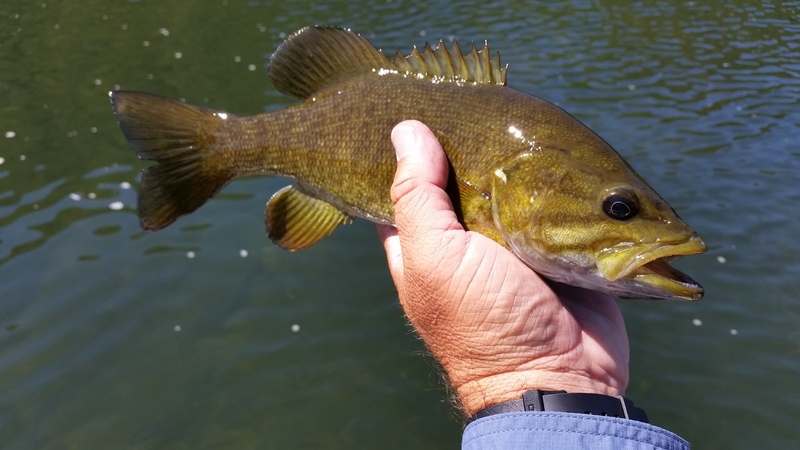 We hope to be able to eek out the remaining smallmouth floats we have on the calendar and then hope for some rain. We need RAIN!!!!!!! Great day, great weather day, guess we caught between 40 and 50 I’d say…..Frank and Larry were a blast to spend the day with. Looks like fall……feels like fall……and it will be here soon! Here is a graphic on the upcoming leaf season/fall foilage report. This was put together by the Dept of Biology at Appalachian State. You can check out the details here and get the full scoop. 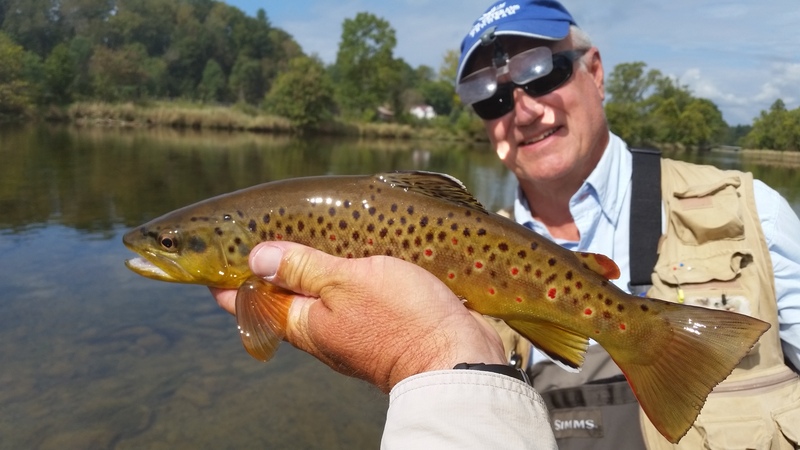 Have a busy week’s end coming will be doing a guided trip with Dan, Ben, and Ken Karb tommorrow on TN’s South Holston river. Looks to be a great weather day. Sulphurs still here and there, fall Olives are building, and there’s still some great midge fishing and fishing to bank sippers with terrestrials. We plan to be right in the middle of that tommorrow. And looks like some rain coming too for Sunday through Tuesday….we need it. Any amount, we’ll take it. And hope for more! Wed. Sept. 16, 2015 …..With the cooler temps and nights I’d definitely say we’ve taken a huge step toward fall. 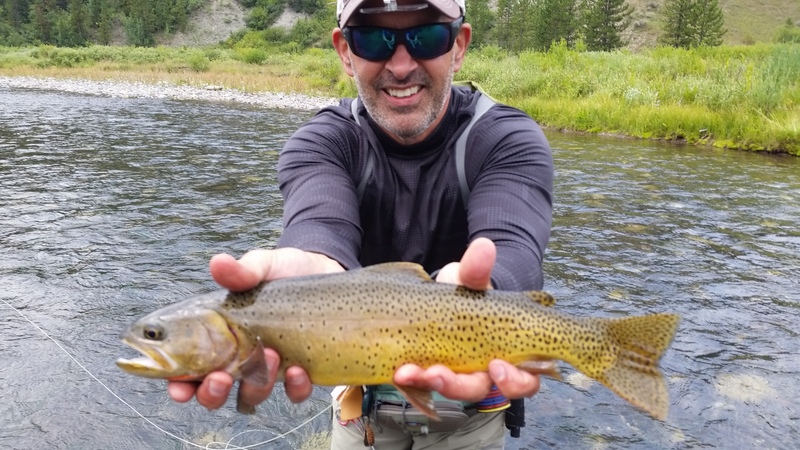 Its Wyoming and Montana weather at its finest….nippy in the morning requiring a jacket but by late morning you are peeling off the stuff….and by afternoon you are fishing in a shirt or short sleeves and enjoying temps in the upper 70s and almost no humidity. The humidity has been virtually non-existent…..its been great. I’ve had a busy week so far, taking care of a lot of stuff in prep for our busy fall and winter seasons, but I did a guided trip with a regular client of mine, Ted Linczak, of Summerville, SC. 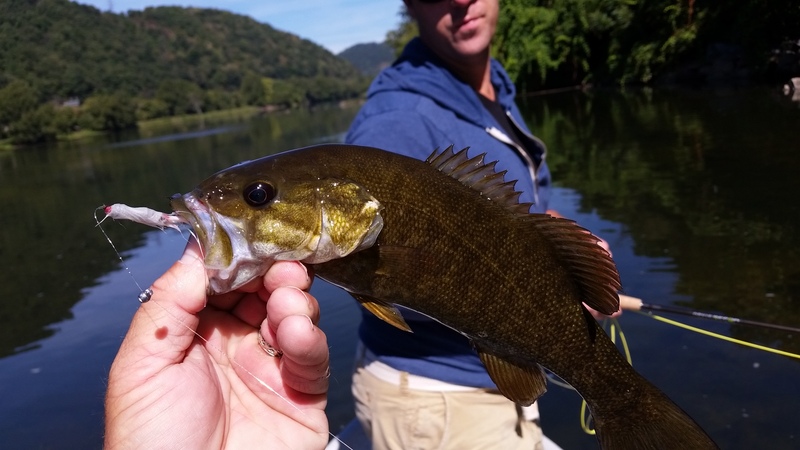 We did a New R Smallmouth float trip, we put in and it was chilly…..brrrrrr…..fall is in the air. Lows in the low to mid 40s will wake you up for sure. We were in the water around 930am or so and while it was not as easy fishing as past trips we started down a favorite bank and were into fish, in fact, the fishing to start would prove to be the easiest fishing of our day. 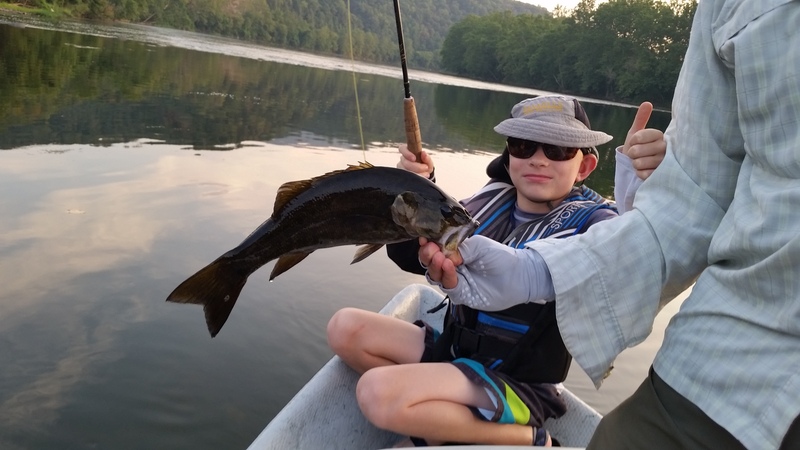 We caught fish pretty regularly, including a few good ones, all of them on a Shenk’s White streamer, a favorite late summer /fall streamer that works on bass and trout alike. Its tantalizing wobble drives them nuts, I guess. 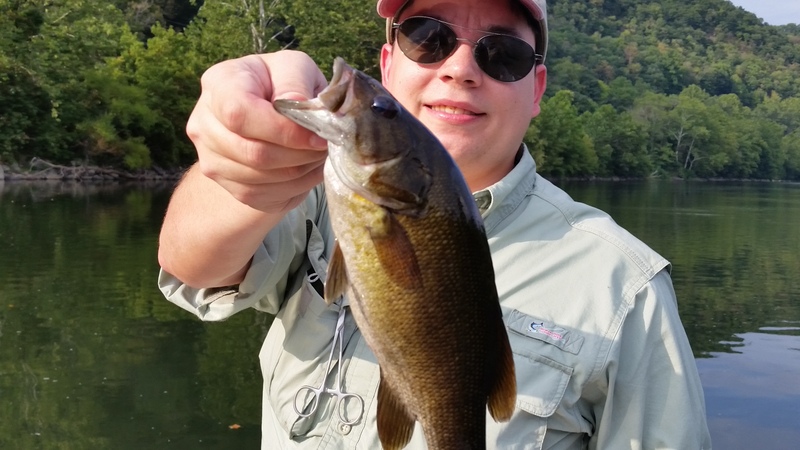 We caught maybe a dozen or so in the first spot, saw two smallmouth that were well over 20″ but they would not eat. We also saw some musky……that gets the heart beating pretty good for sure. We fished some areas of grass too and while we saw fish we didn’t catch any in the grass like we had on previous trips. The fish were very spooky for sure. Saw a few more large ones but they were quite spooky and would not eat. 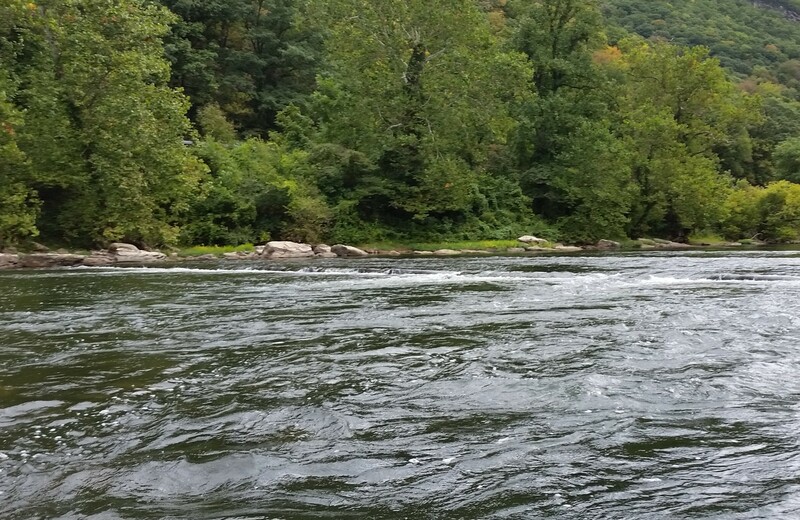 We blew through some of the rapids and went on to slower /deeper water where we were on more fish. We would catch one here, one there, get a couple of hits, and so on. We caught fish but we really worked hard for them. We hit a couple of stretches where we got a few topwater bites, and ended up catching several fish on top, including probably the best one of the day, toward the end of the float. I guess we boated maybe three dozen total, including a couple redeyes and redbreast. Great day , always is with Ted, we had a good time, enjoyed the weather too. What a nice day……and the leaves are really beginning to turn as well……it will be Fall before we know it. Had a busy Wednesday finishing up some of our extensive web site maintenance as well as some of the rebuild of our shopping cart. Very tedious, but its coming along great. I’ll be doing a Thursday float trip with Larry Tomar and Dr Frank Kincaid. Looks like we’ll have a near perfect weather day and hopefully some great fishing to go along with it. 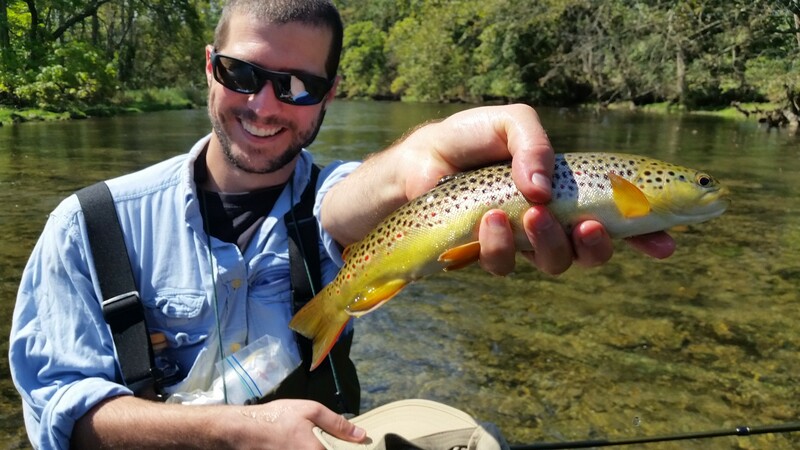 I’ll round out the week with a TN trip to the South Holston with Dan and Ben Karb, and their dad Ken. Fri. Sept 11, 2015 – This report has been a long time coming………months in fact. Just coming off the busiest summer I have yet known, and its been great. Shared or made more memories with long time clients, plus met a few new ones along the way. 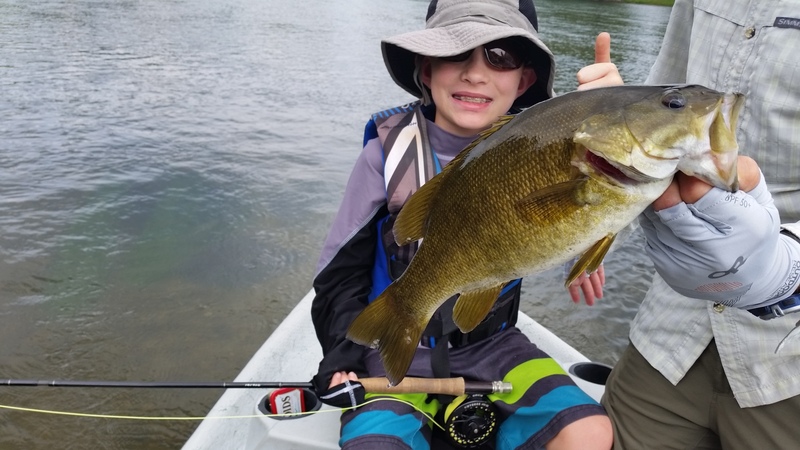 We have had an awesome summer……from great terrestrial fishing (epic at times), to a ton of float trips with epic hatches and dry fly fishing, and some of the best smallmouth action we’ve ever enjoyed. 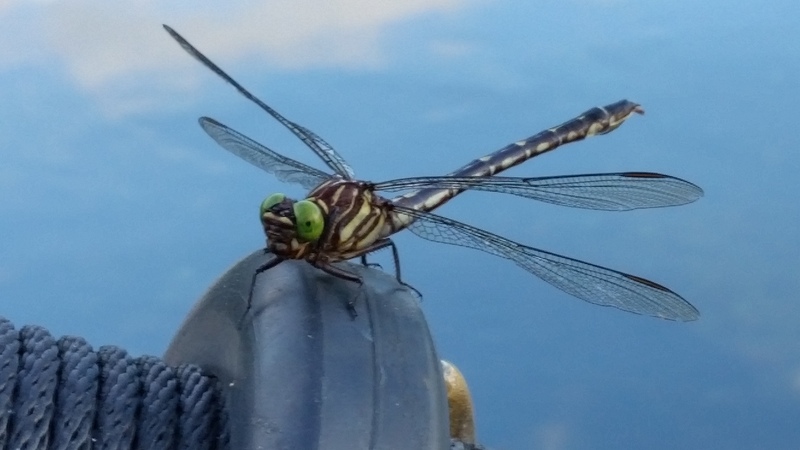 I have done a lot of wading with clients, but my rear end has some weeks assumed the shape of a rower’s seat as I have spent hundreds of hours this summer behind the oars……its been great. 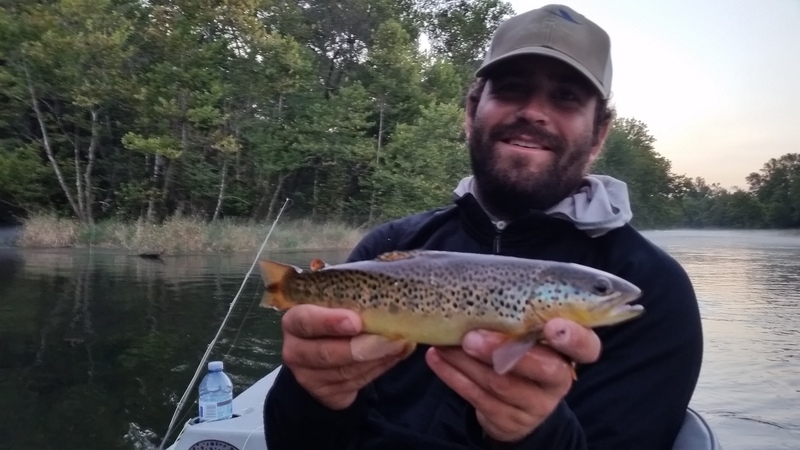 We topped it off with another great Wyoming trip, and have been putting the finishing touches on late summer with some continued terrestrial action, numerous South Holston and Watauga floats, and tons of smallmouth floats. I apologize for not being on the spot with timely reports but only so much that I can do…..have put in a lot of 15 hr plus days this summer. Just not enough time……up really early, load the vehicle and the boat, guide/fish all day, prepare for the next day….repeat. Many weeks of back to back to back to back to back…..5 to 6 days straight, all summer long. And Fall looks to be just as busy…..if you are looking to do a trip before 2016 now is the time to book, my bookings are up 20% and our Sept , Oct, and Nov will soon be taken. 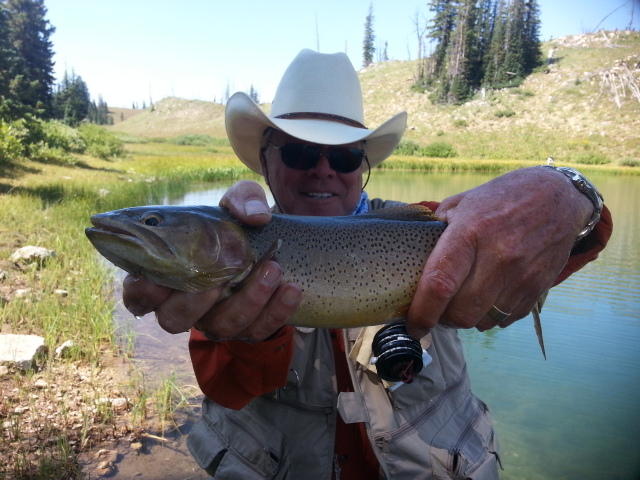 In case you haven’t looked at our site, here is a recap since Wyoming on our trips…. 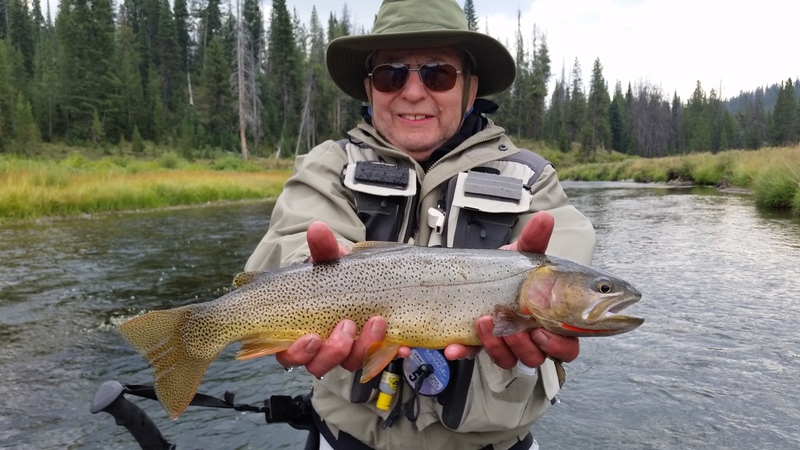 8-11-2015 FISHING REPORT – Wow….. we had some great dry fly fishing so far, fishing several of my fave high meadow waters and larger waters fishing well too. 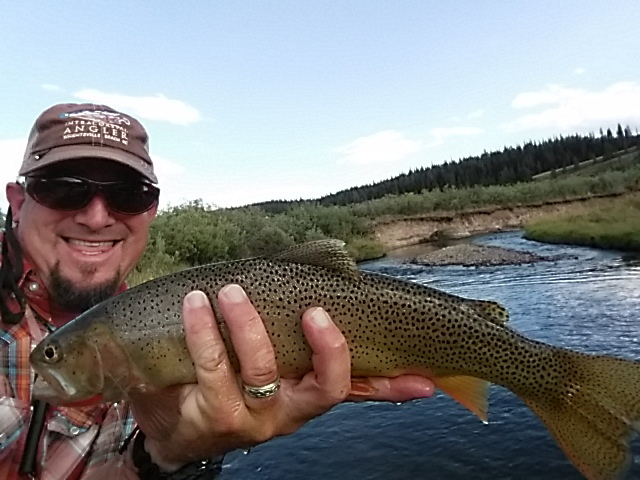 Had some great dry fy fishing, including one nice cutt last night about an hour before dark that ate one of our size 12 Rubberleg Stimis….one of my favorite cutthroat patterns and one I am never here without. Here are a couple of pics…..after today we’ll be off the grid many , many miles by horseback into the high mountain wilderness in Bridger Teton National forest. I am awaiting arrival of our group and will be picking them up this afternoon at Jackson Airport. Great trip , great bunch of guys, we caught some great fish, shared some great fellowship and laughs, ate some incredible meals together…..a real blast…..they were great. On this year’s trip Dr Pat Burney, Dr Hy Muss, Ted Birke, Dr Ken Karb, Shaun Redgate, Dr Houston Kimbrough. Thanks guys! 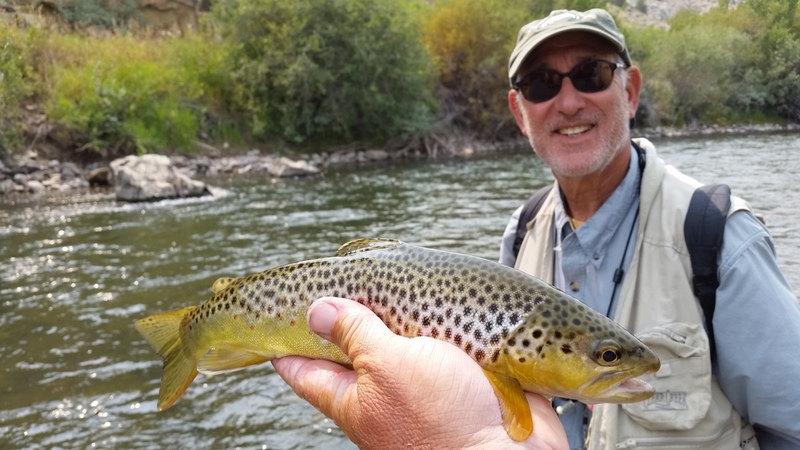 Already taking reservations for 2016’s trips……..You need to join me for 2016! Arrived home pretty late, had two extensive layovers in Minneapolis/St Paul and Detroit, there was a severe weather system/front/tornado warning and we stayed just ahead of it. Very bumpy flying w/lots of turbulence……great to be back home on NC soil. A couple days rest and a busy end of summer and fall lies ahead. Great trip though, always somehow with the fishing/fellowship/fun seems to top the last one. But that is what happens when great folks are along, and I can truly say my customers are the best. 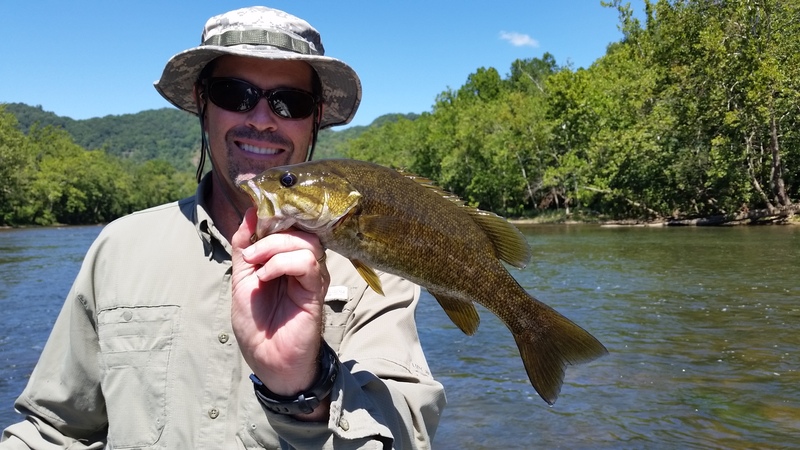 8-25-2015 FISHING REPORT – Guided Trip, Bob Stanford, Greensboro, NC, David Slaydon, Reidsville, NC, New R (Giles Co, VA) smallmouth float trip, met David in Wytheville and we were off, we floated a 6.5 mile section of river and did very well. We fished both flies and light tackle, water conditions were excellent, tons of grass in the river and the fish are on the feed for sure, for first trip since back from Wyoming it was excellent , I expect we landed close to 75 smallmouth altogether, including several chunks in the 12 to 14 inch range. Lots of quality fish…..a long day but a great one….Sept is going to be great, and I expect good fishing til the end of the month. 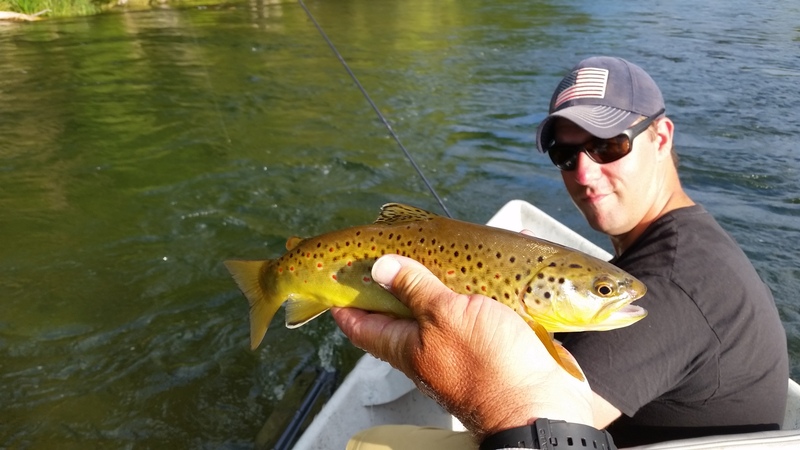 8-26-2015 FISHING REPORT – Guided Trip, Ted Linczak, Summerville, SC, TN South Holston wade/float, we did a morning to midday wade trip then followed that with a float. Morning fishing was good, we nailed several good fish on terrestrials before switching to dry/dropper rigs and nailing a bunch more. Standard morning SoHo fare…midges and blackflies. We also just before the first water rise briefly switched to a sulphur and Ted nailed several more. 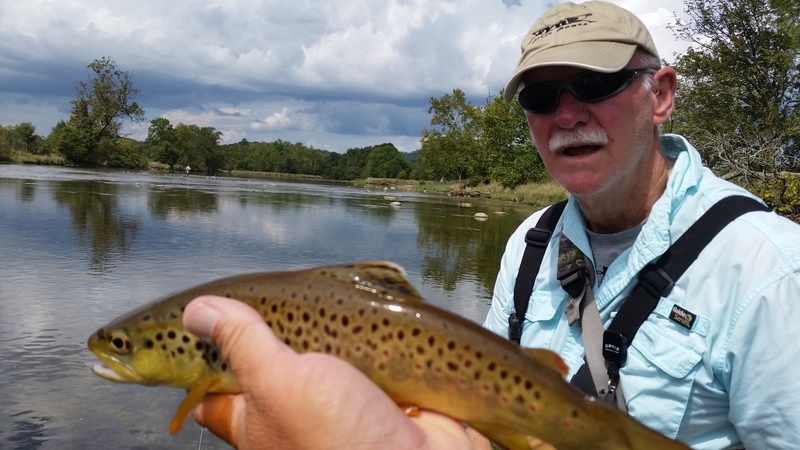 We then headed way downriver to another spot and fished a dry /dropper rig and caught a couple more browns, then switched back to terrestrials and landed a couple more. All in all probably 25 fish or so til 2pm when we drove upriver to float. A good morning by any standard. Make a good cast, right fly, the fish would eat. We only had one large fish that gave us the snub…..but he did look several times before slowing sliding off into deeper water. We put the boat in and had the entire 5miles to ourselves. No other boats…sulphurs, rising fish, fish were pretty picky but that’s normal. They’re wild fish, that is what wild fish do. We still caught a good many, while bugs were coming off thick the fish were challenging but as soon as the flies thinned out some our success went up. Normal. We had several takes/misses. Normal. We had some refusals. Normal. We had some takes. Normal. We caught fish. Normal. We fished on downriver and looked for risers, when we found some, we got them to eat. Bugs were almost gone by 630 or 7pm but if you could find a riser, and we did, about 3/4 of the ones we saw would come up for the fly. 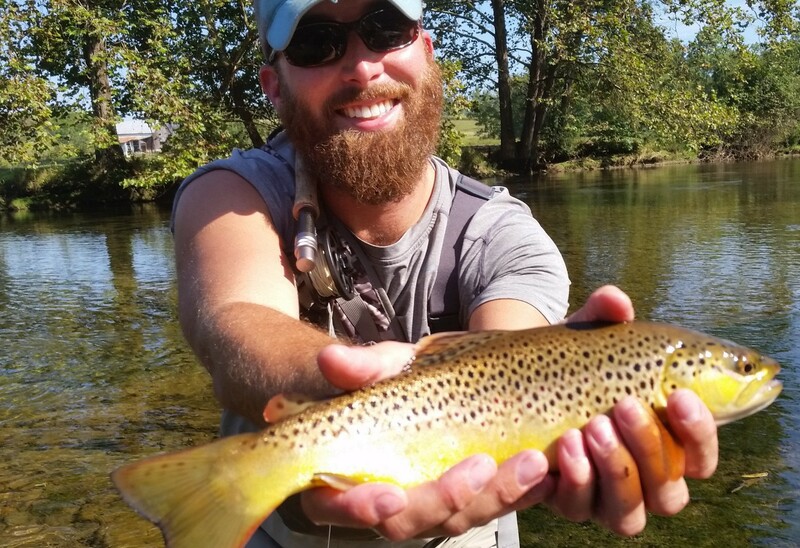 We caught a couple nice browns, then floated on in hopes of finding one more spot. And that we did, there was a heavy high water spinner fall toward the end of the float, and we found a pod of rising browns. Ted nailed three out of that pod , ending the day on a good note with around 10 fish or so on our float . We finished up/pulled the boat out under cool temps and a dramatic sunset. Great day, Ted was great as always. Finished the day feeling sick, some sort of cold thing…..felt pretty rough. 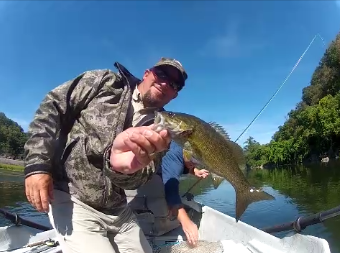 8-27-2015 FISHING REPORT – unavailable, Jeff is sick/under the weather……bummer! 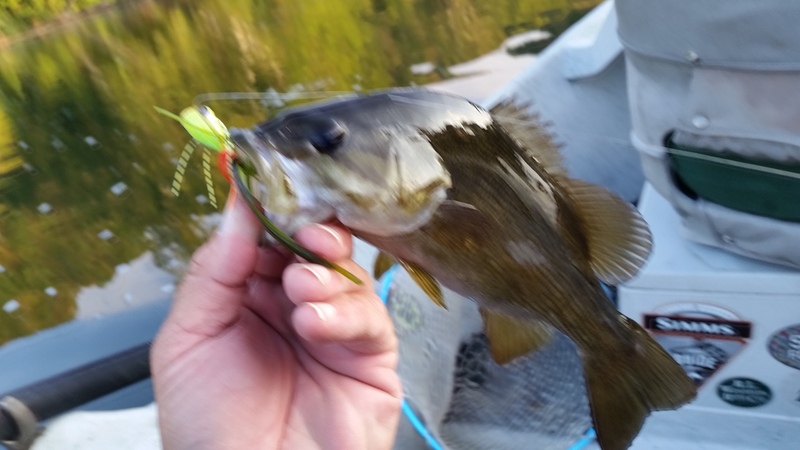 8-28-2015 FISHING REPORT – did not guided a trip, was feeling pretty bad still and opted for doing a major shopping cart site overhaul, some regular web maintenance you have to do, lots of fun since I do all my own webwork….actually that was a joke, its quite tedious. But in an attempt to keep stuff fresh, updated, functioning properly, its a must. I do several planned/scheduled site overhauls a year for that purpose. Worked out well since I’ve been under the weather the past few days…..great time to be stuck inside for doing it. We are constructing the framework, and our new shopping cart site will carry the Gold seal Certified status with McAfee security, the highest security an ecommerce site can have. Our new shopping cart site should be live in a few days , here’s a sneak preview….click here. 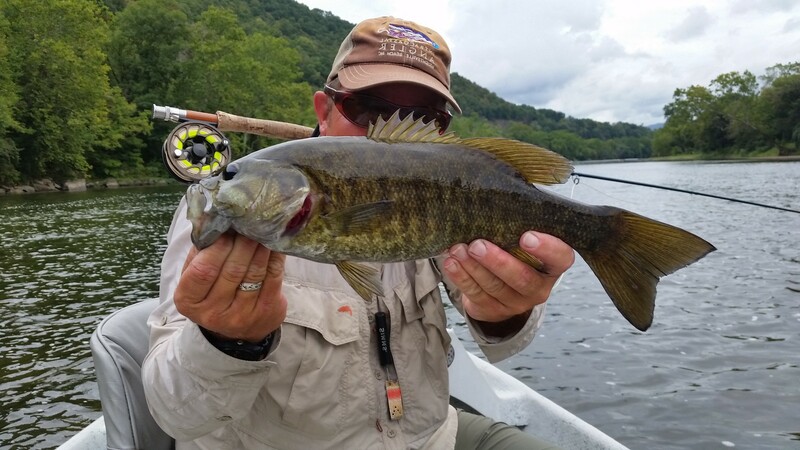 9-4-2015 FISHING REPORT – Guided Trip, Anthony Hipps, Lexington, NC, New R smallmouth float, we opted for a later start and it paid off, we nailed some fish right off on top using poppers, some were cruisers and bank cruisers and others were in the grass…..smashing bait. We would see a fish erupt and then cast to them…. caught several this way. It was great, then we moved downstream to a stretch of fast rapids and Anthony smoked em pretty good on his two streamers of the day, the Hellcraw and his version of a Shenk’s white streamer. It worked great, we caught a pile. 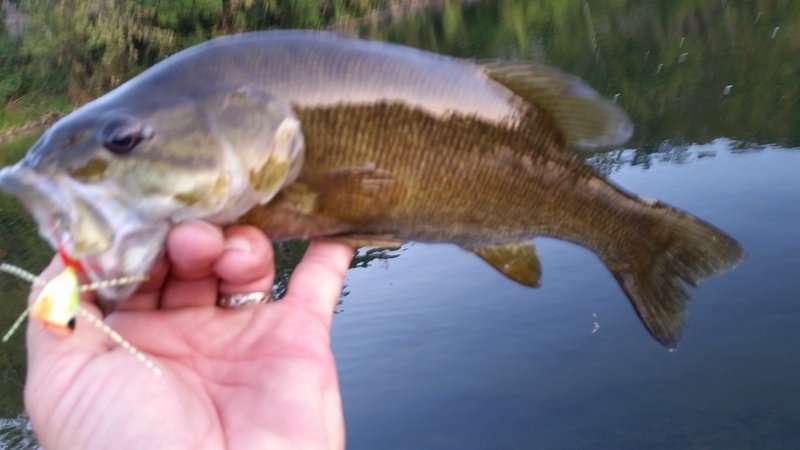 Then we moved to the next grass flat……nailed several more good bass on a popper, did well on that, landing several really nice smallies. Then to the next stretch of rapids where Anthony caught several really good fish, one in particular that was in a stretch of boiling white water that is hard to get to….I pointed to the spot, Anthony made a cast and nailed the fish. Then landed it, and cast to the other side of the boat and nailed another big smallie. It was great, we fished on through some more rapids and I watched him put on a streamer clinic with the Shenk’s streamer…..nailing fish after fish. We got back into some flat water and then put a popper back on and it was game on. Nailed a nice fish right off, off a deep bank, then moved on and spanked them on every rock bar we set up on. It was great. 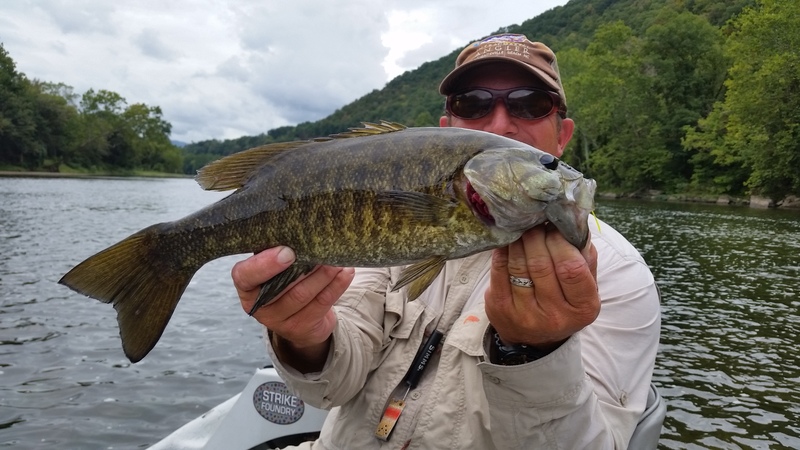 Great day with one of my best friends in the fly fishing community, and one I consider a ‘brother’….great day with over 50 smallmouth in the boat…. 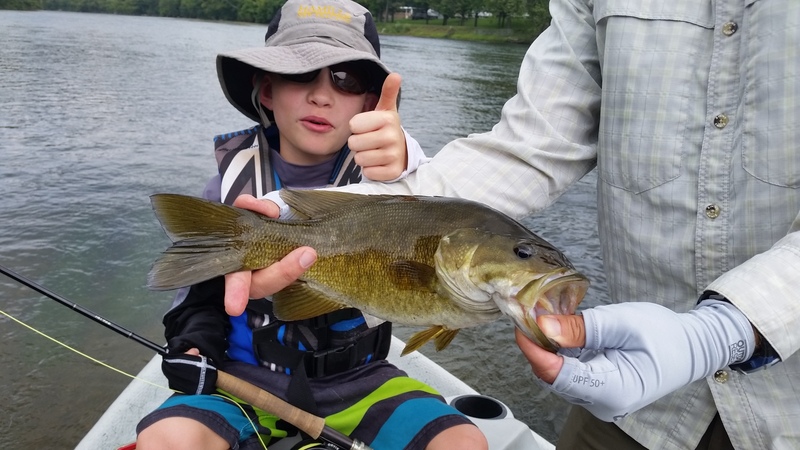 9-5-2015 FISHING REPORT – Guided Trip, Adam Norris, Winston-Salem, NC, New R smallmouth float, ,met Adam, his dad, and his 9yr old son Jonah in Va and we headed out. Got a midmorning start and nailed a few early on poppers, but then it got really windy. We fished some rapids and caught a few on streamers. The wind was supposed to be light and variable, and it was variable but light it was not. It gusted to 20 to 25 mph effectively ending our popper bite but then it laid down within the next hour. Meanwhile we caught some fish on a white streamer, then moved on to another large grass flat that I knew held some fish. We did very well, catching several nice ‘toads’ on poppers, including the best fish of the day, a chunky , stocky fish of about 2.5lbs or so. We caught several more, missed a few, one that appeared to be a really nice fish, but then moved on and pulled up on a mid river island to have lunch. After a nice shore lunch, we walked down to a mid river bar and set of riffs and caught several fish on a popper, then several on streamers….the white streamer and a JJ Special. After several fish we then hopped back into the boat and hit a long stretch of rapids/white water and fished a little caught a few here and there. 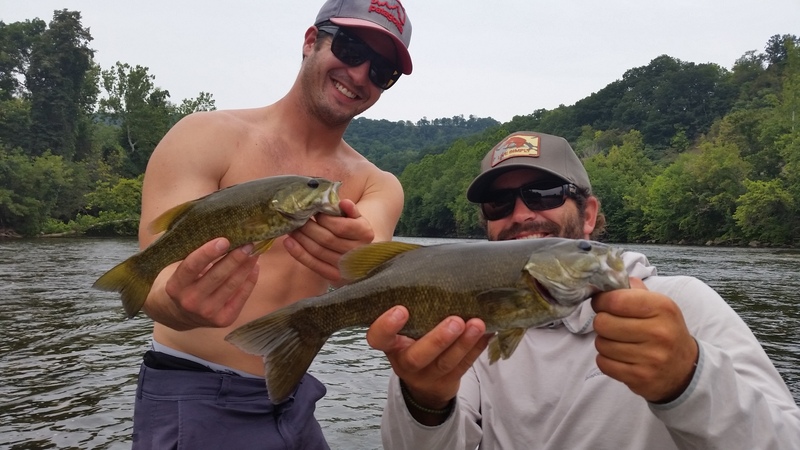 We then hit one of my favorite flats and went to the tail end of it where it spills into a large mid river rapid and we saw fish rising/jumping….we threw poppers on those guys and nailed probably 6 to 8 nice smallmouth. It was great, all of them ate a popper. We then headed downriver and fished 3 mid river ledges that are all surrounded by deep water and smoked them….catching fish at everyone. 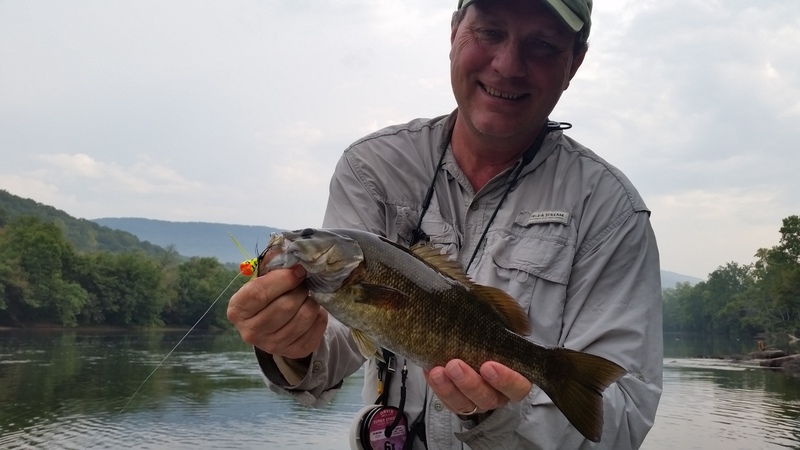 We finished the day with a few more, including one at one of my favorite end of the trip spots, two casts and we nailed a nice smallmouth on a popper, one that was close to fish of the day size. It was great. With light fading, we decided to head on to takeout since we had enough light to see to get through the one last rapid before the boat ramp. Great day, Adam and the guys were great to spend it with…..an absolute blast. 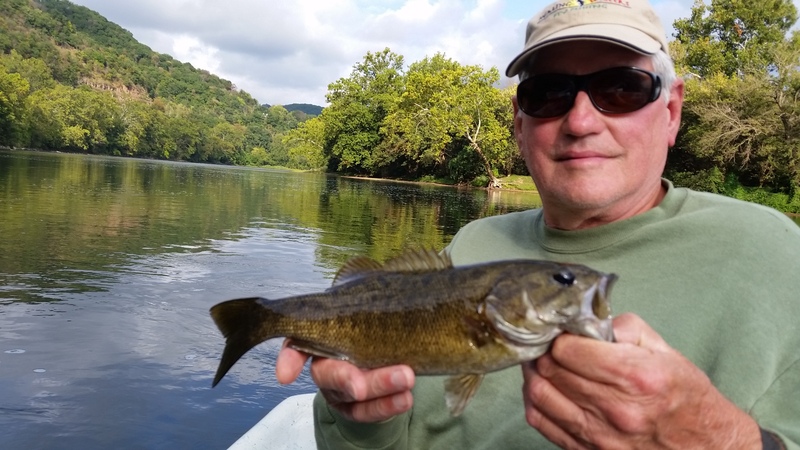 I’d say we put over 40 in the boat today…..
9-10-2015 FISHING REPORT – will be floating a section of the lower New with fellow guide Tom Smith, we met up early in Wytheville, Va and were quickly off to our short float. Heavy rains all night, and even right up to the time we met but surprisingly the river was in great shape. Same level as it has been for a month, clear…..and we put the boat in and were off. Tom and I traded off time fishing and on the sticks (oars), and we had a very enjoyable day, putting about 30 smallies in the boat. Not as much topwater action as past months , we still caught a few, and lost one giant on a popper that mashed a Hipps popper and was on for a couple of seconds and then came off. We got wind and rain midday and it rained, at times moderate rain, and the topwater bite was way off but it gave opportunity to do some long leader hopping presentations with an indicator and some crayfish patterns, a deadly technique when you are faced with changing weather and the fish won’t come up. I had a rod rigged up and Tom and I smoked them on this rig/technique, catching a good many nice fish and one that was over 20 inches, a fish of probably 4 to 4.5 lbs…..proof enough along with several other larger fish that the technique is deadly. We hit one spot where we caught a few more on poppers but we did far better with the bottom bouncing techniques. We fished on to our takeout and just missed getting soaked as a gray, threatening sky was moving upon us. Got the driftboat out just in time to miss it. Great day, though getting wet has been a daily thing here lately…. Hopefully we’ll get back up to speed with more regular reports like we used to, that is the goal anyway. Looks to be a very busy fall coming up, I’ve been very , very busy booking trips. Will likely be one of the busiest fall seasons ever. 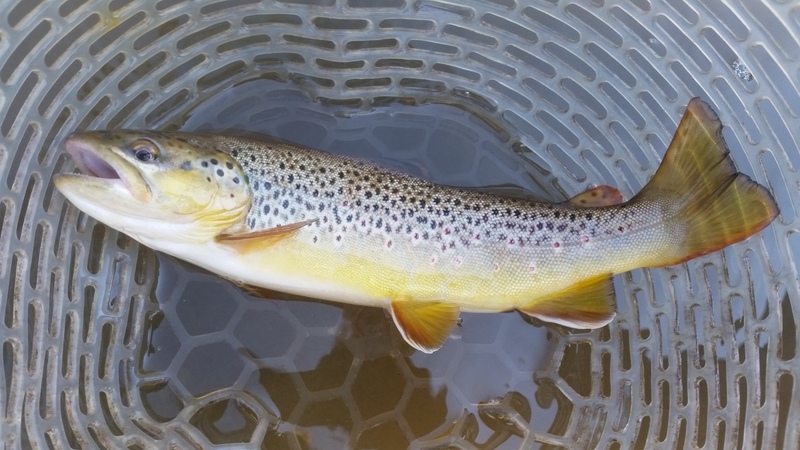 We are starting to get rain again regularly, which should help our trout waters. Long range weather forecasts look normal, with a sharp cool down coming early next week, in which the lows will be in the 40s with some mountain areas hitting the 30s. That will get the leaves turning for sure, then it looks like seasonable temps after that. 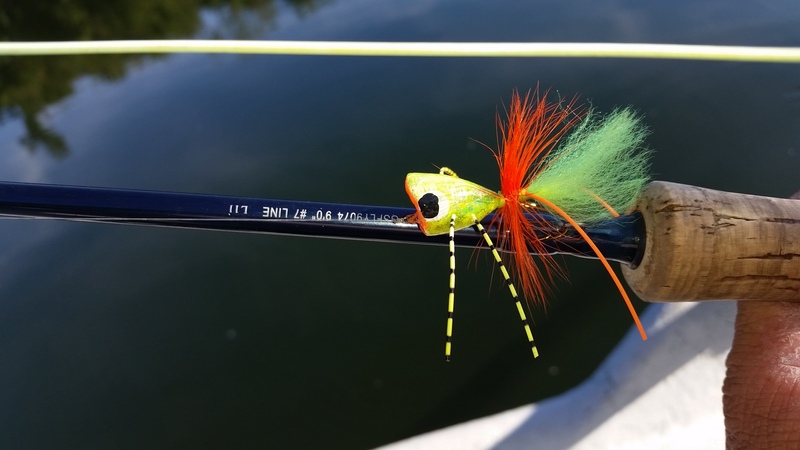 The cooler temps will bring on the caddis and blue winged olives everywhere, and will close out the smallmouth fishing too in the coming weeks…….at least the best fishing with flies, and certainly topwater fishing…..but it will also bring muskies into the spotlight.